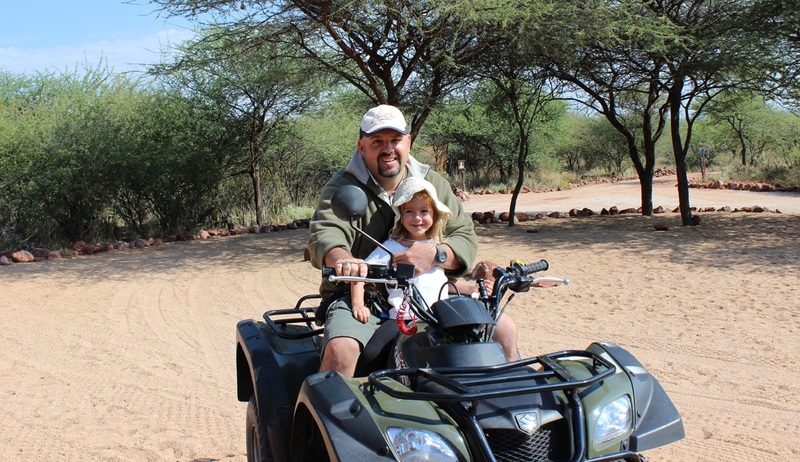 The 10 day Family Adventure is a safari that has been specially designed for families with small children. 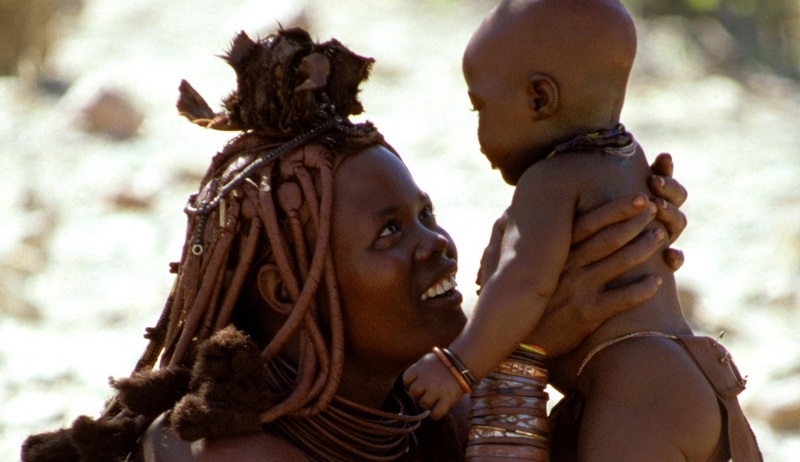 Experience the most beautiful dunes in the world, vast stretches of mountainous vistas, Himba tribesmen and countless wild animals. The minimum age on this itinerary is 5 years and all children aged 12 years and under can travel for half price. 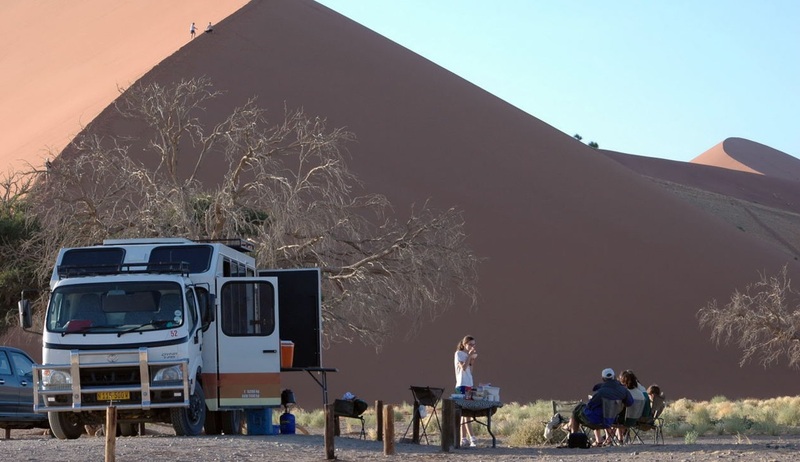 The driving distances have been kept to a minimum, (not easy in a huge country like Namibia and there are still a few long drives), and as many sites as possible are included that will appeal to adults and children alike. This 10 day adventure is operated as a camping tour, staying in good sized tents which are provided with mattresses and covers, chairs with backrests, tables, washstands, cutlery and crockery. Sleeping bags for the winter months may be hired or you are welcome to bring your own. Participation may be required for the set up of your tent but everything else including meals and camp duties will be taken care of for you. The trip also includes two nights in accommodation in the coastal town of Swakopmund. Speak to someone who’s been to Namibia. Start planning your tailor-made trip by calling one of our friendly destination specialists on 0800 195 3385 or 44 1625 581143 for outside the UK. You will be collected between 08:00 & 08:30 am and taken to the office to meet with the rest of the group. Once everyone is together, we can leave Windhoek and head out towards the desert. Our drive today will take us through the Khomas Hochland range of mountains and then further south west towards the Naukluft Mountains. Lunch will be on route and then we reach open plains and from here it is only a short distance to our next stop, the tiny town of Solitaire. We will stop here for some fuel and refreshments before continuing on a short distance to our camp for the night. 2 nights camping at Agama River Camp on a full board basis. Dinner is cooked over an open fire. Agama River Lodge & Camp is a wonderful oasis, a simple group of campsites which include well decorated and spotlessly clean ablution blocks partly open to the skies! The camp sites are scattered along the lower 'dieprevier' river course, each campsite is built under large acacia trees and surrounded partially by a wooden pole barrier acting as a wind shield and offering some privacy, they are terraced and levelled with clean river sand. Each site contains; a free standing tap, wash up facility, a braai area with grid, a twelve-volt energy saving light (that can be attached to your car battery) and is easy walking distance to your shared ablution facility. A pre dawn start is essential this morning as we want to catch the soft light of the sunrise on the desert. After passing through Sesriem at sunrise, we drive into the dry river bed and will soon start to see the dunes on either side of us. We stop for photos along the way as this is where you see the strong contrast of colours as the sun hits the sides of the dunes. We stop for breakfast and prepare for our walk. The walk is like nothing else, in the cool of the morning, with soft sunlight just beginning to play over the dunes creating a sharp light and shadow contrast across the whole desert. Ancient mineral pans, stunted camel thorn trees and the chance of seeing a gemsbok or maybe an ostrich make the photo opportunities perfect. We spend the morning in and around Sossusvlei, also visiting dune 45, and as the day wears on we return to Sesriem for lunch to escape the heat of the afternoon. As the day cools off in the late afternoon we will take a short excursion to the Sesriem Canyon. Later in the afternoon we return to our campsite and look forward to swim in the pool and supper. An early start today, we are heading north-west to the seaside town of Swakopmund located on the Skeleton Coast. Leaving the dune fields far behind us we are soon back into the mountain desert. In the Solitaire area we will stop at the ‘N/a’an ku se Namib Conservation Centre’, a 500 hectare Conservation Centre which hosts an educational centre and wildlife tracking within the purpose built enclosures and receive information on the carnivore surveillance in the greater Namib area. After our educational tour we depart and cross the Tropic of Capricorn and traverse both the Gaub and the Kuiseb pass, driving down to the dry river bed at the bottom of the canyon before climbing up the other side, watching the spectacular desert landscape unfold before us. From the mountains we cross the desolate “Namib gravel plains” before reaching the coastal sand dunes at the port town of Walvis Bay. We will stop for a picnic lunch beside the ocean and there will be time to see the flamingos and other bird life in the Walvis Bay lagoon before continuing the now short drive into Swakopmund. 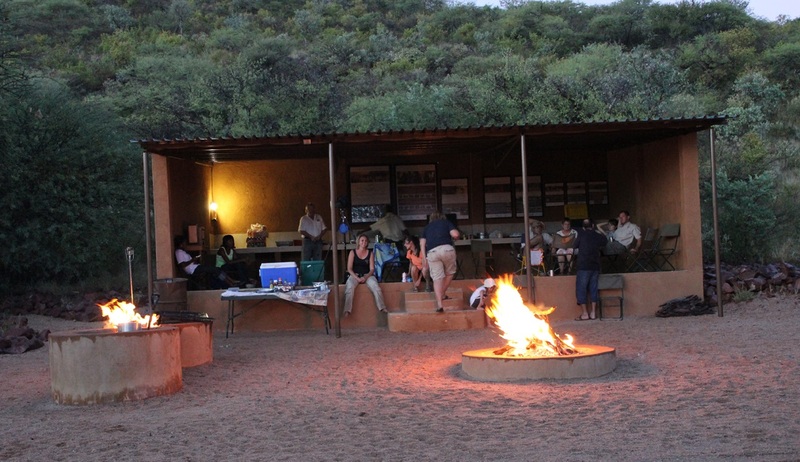 The Swakopmund section of the trip is designed to allow people to relax either with the group, or on their own. Only breakfast is provided, this is to allow you to plan your time here with as much flexibility as possible and not to be tied to group meal times. It also gives you the chance to sample some of the excellent local cafes and restaurants. The seafood in Swakopmund is superb. Your guide will offer to organise a group meal in a local restaurant for this evening. Participation is recommended but by no means required. 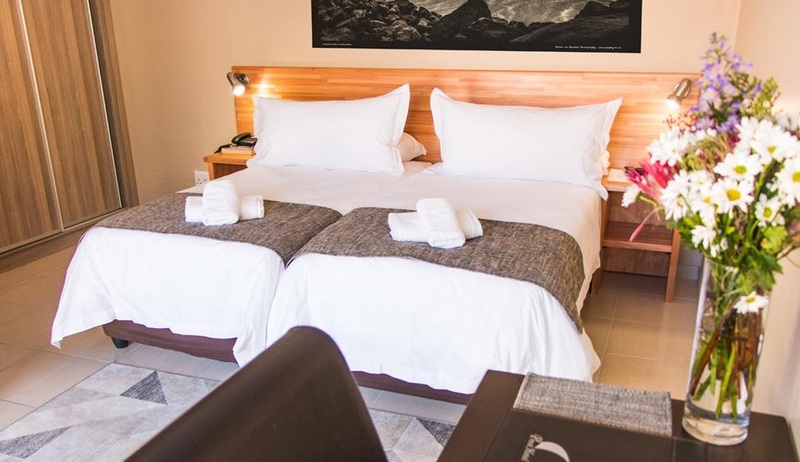 1 night stay at Prost Hotel in the heart of Swakopmund with breakfast. Dinner this evening in not included in the price of the safari and will be at the customer's expense. Today you will be doing the Dolphin Cruise at Walvis Bay, your guide will take you to the meeting point where you will meet your skipper. Once aboard, the journey starts from the Walvis Bay Waterfront and continues into the beautiful Bay Area, which holds more beauty than the eye can at first capture – A Shipwreck, Lighthouse, Oyster Platforms, different Bird species, Seals and more Marine Life. In the Bay Area, our catamarans pass the Oyster Platforms. Along this route, your guide will share more information with you about the Walvis Bay cultivated Oysters. Included in the tour is the tasting of these delicacies. The catamarans will then proceed to the ever-growing Pelican Point to have a closer look at Walvis Bay’s Lighthouse. The old supply railway spoors can still be seen from the years when the Lighthouse was still occupied by the Coast Guards. Pelican Point also has its own little Jetty, but this facility is only used for our Corporate and Closed Charters. Moving around the Point, 3 different types of Dolphins may be encountered, namely: the Heavyside Dolphins – which are the most important, as they are endemic to the coast of Namibia, Dusky Dolphins and Atlantic Bottlenose Dolphins. In Season, the larger mammals like the Southern Right Whale and the Humpback Whales may be spotted and with a bit of extra special luck, the mighty Killer Whales (Orcas). Sightings of the Mola Mola (Sunfish) and the Leatherback Turtles also keep our guest on the look out! All this can be seen while comfortably relaxing in the Saloon, trampolines or on deck, whilst enjoying a glass of Sparkling Wine and snacks. In the afternoon it’s your free time to do more Adventures Activities as below or just relax on the Beach. The idea is to allow time for everybody to do their own thing. Swakopmund is a very pleasant seaside town with lots of shops, a good stretch of beach (although the Atlantic here is quite cold) and an open-air curio market. There is also a very good museum and the Namibian National Marine Aquarium is located in Swakopmund. Alternatively, there are various optional activities that can be arranged. These include aeroplane and microlight flights over the desert, scenic drives, fishing trips (both from the beach or in a boat), four-wheel motorcycle (quad bike) trips into the desert and over the sand dunes around Swakopmund, sand boarding trips (also in the dunes), skydiving, surfing, bird-watching and many other activities are available. Your tour guide will discuss all the possible options with you before you reach Swakopmund and will offer to make bookings in advance of your arrival. (N.B. All extra activities and excursions in Swakopmund are subject to availability and are made at the clients’ own risk and expense). Dinner this evening is not included in the price of the safari and will be at your own expense. Leaving early and heading north along the coast, we will first visit the seal colony at Cape Cross where it is possible to see thousands of Cape Fur Seals in the water and on the surrounding rocks and beaches. From here we will turn east, inland and back into the desert, travelling on to the small town of Uis, an old mining town, located more or less in the middle of no-where. Uis is one of the best places to buy semi-precious stones for which Namibia is famous. Here, rough Amethyst, Tourmaline etc can be found at bargain prices. From Uis we pass Namibia’s highest mountain, The Brandberg, (2573 m) and continue into one of the most beautiful desert regions in Namibia, Damaraland. Brandberg Mountain is an ancient Bushman spiritual site. 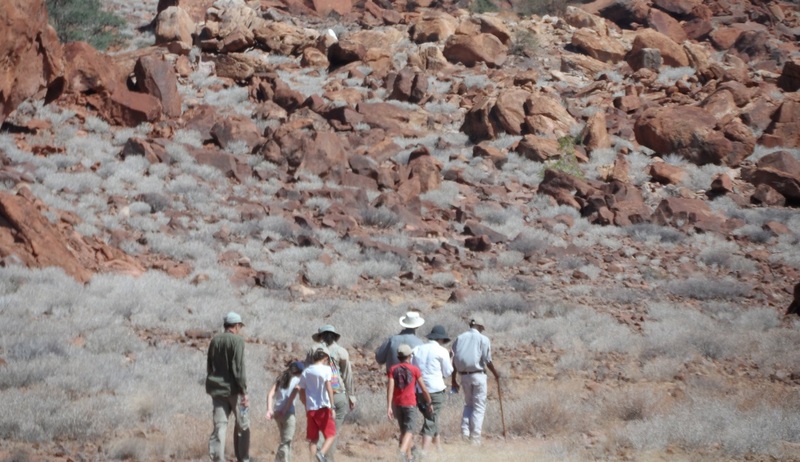 We continue driving to the Twyfelfontein area where we can stop over at the Burnt Mountain and the Organ Pipes. 1 night camping at Madisa Campsite with full board. Madisa Camp is hidden between amazing rock formations which are scattered with Bushman Paintings and has privy to an ancient Desert Elephant route that often gets visited by these beautiful giants. 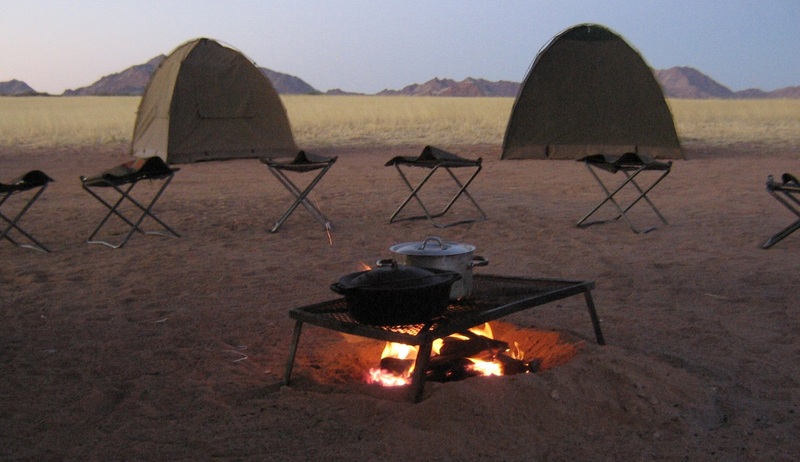 Ideal for the traveller who wishes to camp comfortably without compromising the experience of exclusivity in this vast and magnificent area of Damaraland Namibia. Each spacious campsite has an exquisite view of the Gauntegab River bed and rock formations. The campsites have individual ablution facilities situated on stilts hidden in the tree tops. The braai facilities also double up as a heater (donkey system) for hot running water at each open air shower. 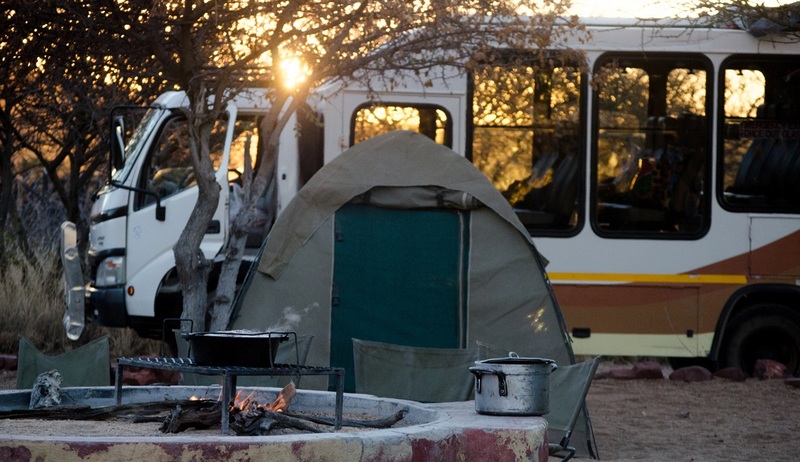 The camp sites are shaded by large Mopane trees and have a low rock wall around each site. The swimming pool and bar area are very welcoming after a long day and give you a chance to rejuvenate and enjoy your surroundings. It’s also nice to meet fellow travellers and share tails around a communal camp fire at night while the sky puts on a breath taking show of stars. 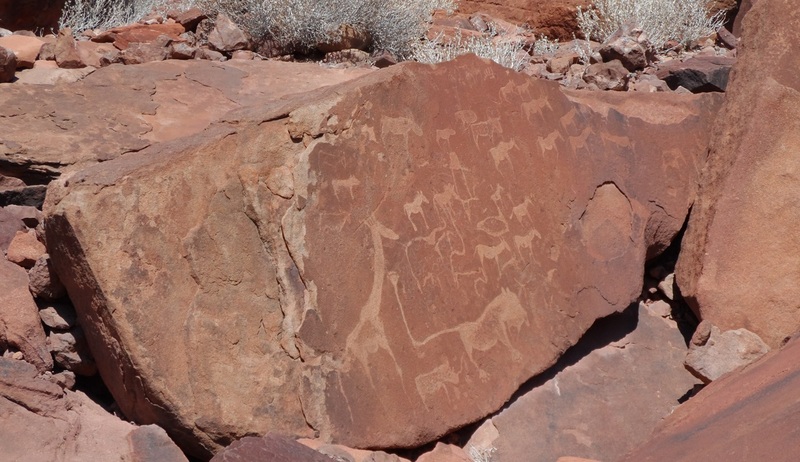 Starting early to enjoy the cool of the morning to take a detour to the west to visit the ancient Bushman rock engravings at Twyfelfontein. At this location we will have a local guide to conduct us on a short guided tour. Leaving the engravings we travel via Khorixas to Outjo for a short stop for fresh supplies and where we can also get coffee and sticky cakes at the local bakery, before continuing on to Etosha’s premier resort, Okaukuejo. 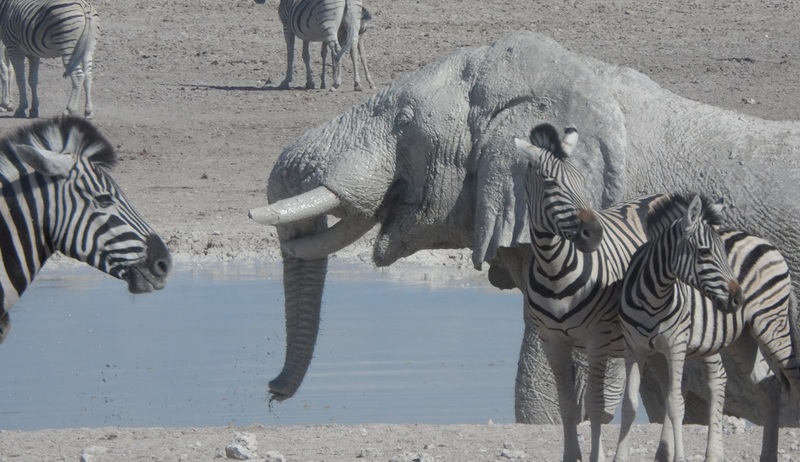 Etosha forms the main game viewing section of our safari and the Okaukuejo area offers us some of the best waterholes in the park and the best chance to see some Big Game. Game driving is not the only way to see the African wildlife at Okaukuejo. Located right on the boundary of the camp and within easy walking distance there is a floodlit waterhole for “after hours” game watching. Okaukuejo is famous for its waterhole, it has been described as one of the “best game viewing opportunities in Southern Africa” and black rhino, elephant, lion and numerous species of antelope are often seen. A full day’s game driving. We again leave early to enjoy the cool morning air as we game drive our way through Etosha to Halali camp, situated in the middle of the park. 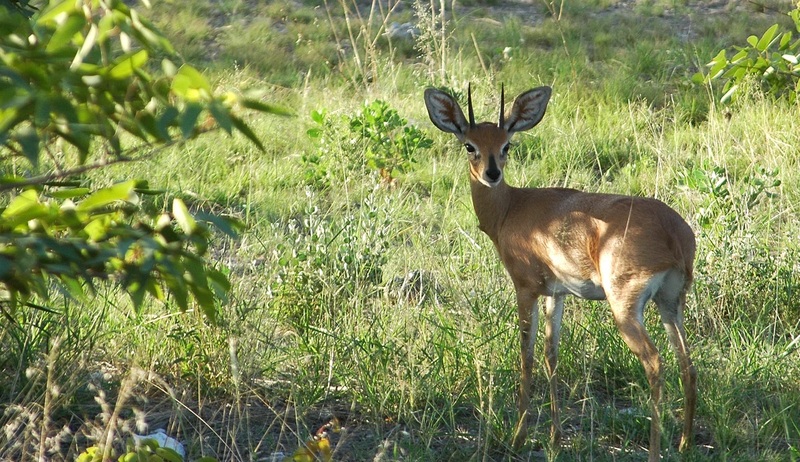 Along the way we visit several waterholes and are afforded splendid views of the massive Etosha Pan. The game viewing is usually excellent and we have the chance to tick off a few new species that are not normally seen on the Okaukuejo side of the park. 1 night camping at Namutoni Campsite with full board. Built into an old German Fort Namutoni Campsite has a unique atmosphere. Within the fort you will find ample facilities. From the walls of the fort you can enjoy an elevated view of the King Nehale Waterhole allowing for great game viewing without leaving the camp. The walls of the fort are also and excellent spot for sundowners. There is hardly a better way to end a day in the bush and Namibia than to marvel at the colours of the setting sun. Leaving the Etosha National Park on the Eastern side where we will be driving through the farmland towards the south to Otjiwarongo. On our way we will visit the Cheetah Conservation Fund, this will includes a Includes a walking tour of their main facility as well as the Educational Centre, Cheetah Museum, Clinic Tour and an introduction to the Cheetahs, Dogs and Livestock that live at the main centre. This also includes the feeding of Cheetahs at 14:00 weekdays and 12:00 on Weekends. After we have lunch we depart and continue driving to Waterberg Plateau which rises some 200m above a surrounding sea of African bush and savannah, the Waterberg Plateau with its flamboyant brick-red sandstone formations and lush green vegetation, presents an island of vibrant colour. The 405.5Km² park, situated 60Km east of Otjiwarongo and 300 Km north east of Windhoek was proclaimed in 1972. 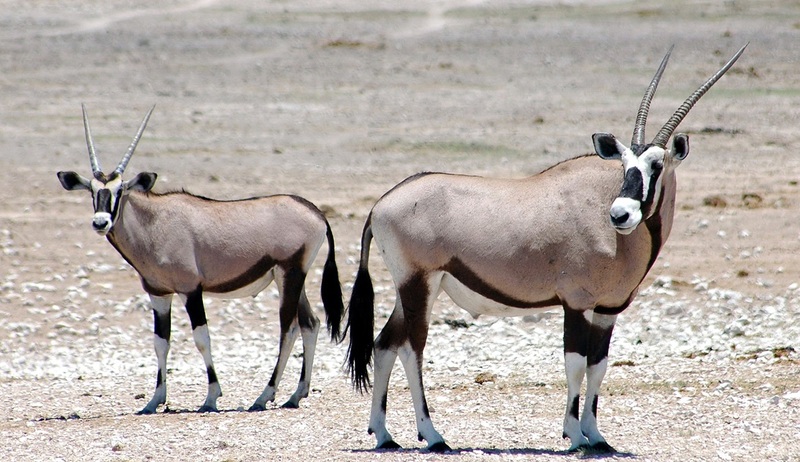 It was originally created as a sanctuary for rare and endangered species found in the Kavango and Caprivi regions, such as roan and sable antelope, tsessebe and Cape buffalo. Today the park is home to some 25 game and over 200 bird species. The vegetation changes dramatically from acacia savannah at the foot of the plateau to lush-green sub-tropical dry woodlands with tall trees and grassy plains at the top. 1 night camping at Waterberg Plateau Campsite with full board. 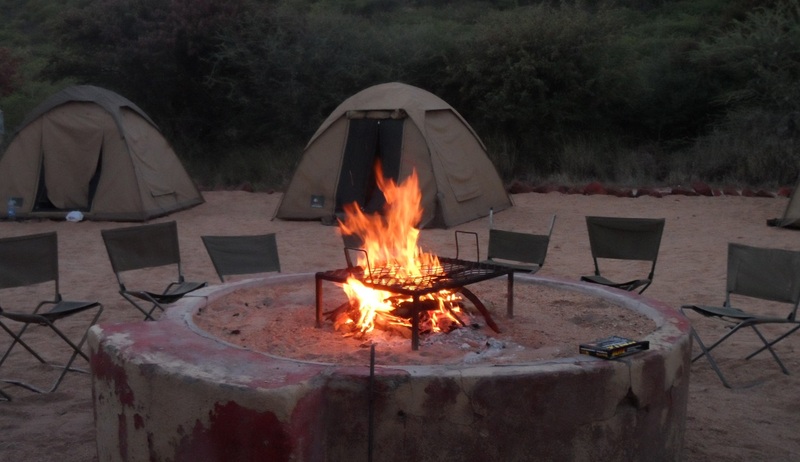 The Waterberg Plateau Campsite is situated on a hill in the valley of the Waterberg near the main reception of the private nature reserve Waterberg Wilderness. 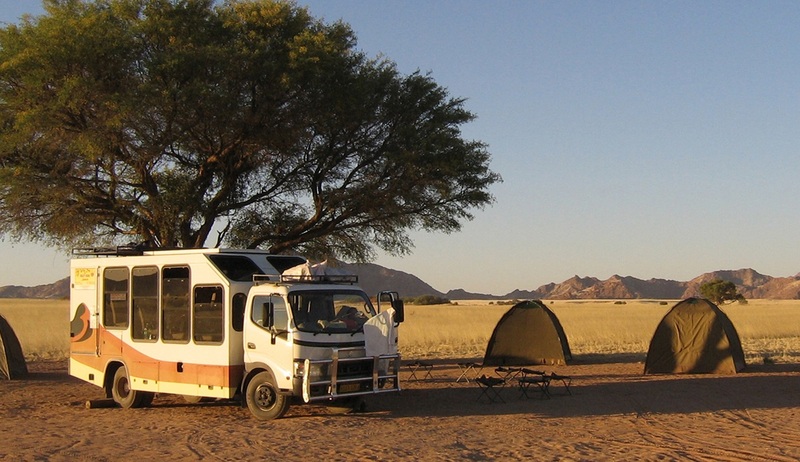 It has eight pitches on the soft, red sand of the Kalahari, separated by bushes and trees. At a roofed bar guests can order drinks, snacks and meat for barbecue and make use of the plugs for recharging cellphone and camera batteries. 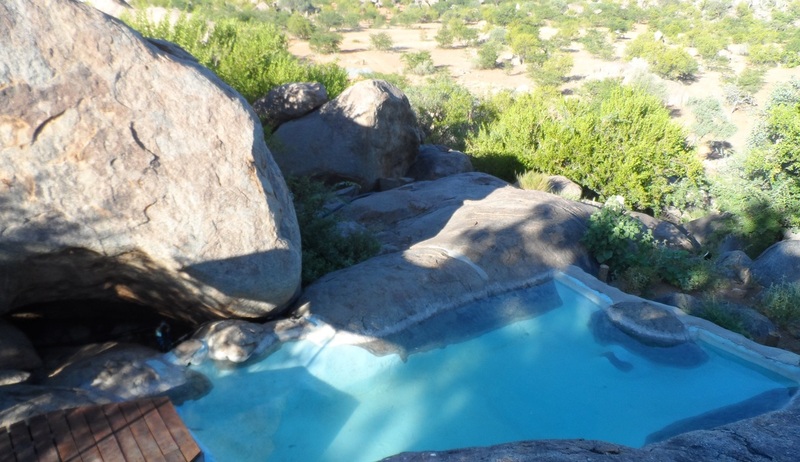 There is a swimming pool and a view point overlooking the Kalahari bush savannah. Each pitch has its own shower/toilet in the central ablution block, with hot and cold water. In the morning we depart and continue driving towards the South towards the small town of Okahandja, the home of Namibia’s largest wood carving market. The stalls operate on a local co-operative basis and offer a vast array of truly Namibian souvenirs. Continue driving to Windhoek – Hosea Kutako Airport for you to check in for your outbound flight. Prost Hotel is situated in the heart of Swakopmund, giving access to the town’s various and excellent restaurants. Accommodation consists of 28 en-suite rooms, ranging from luxury, family to standard rooms. All rooms are equipped with 43” flat screen TV, own DSTV decoder, electronic laptop safe, tea/coffee station, telephone and hair dryer. 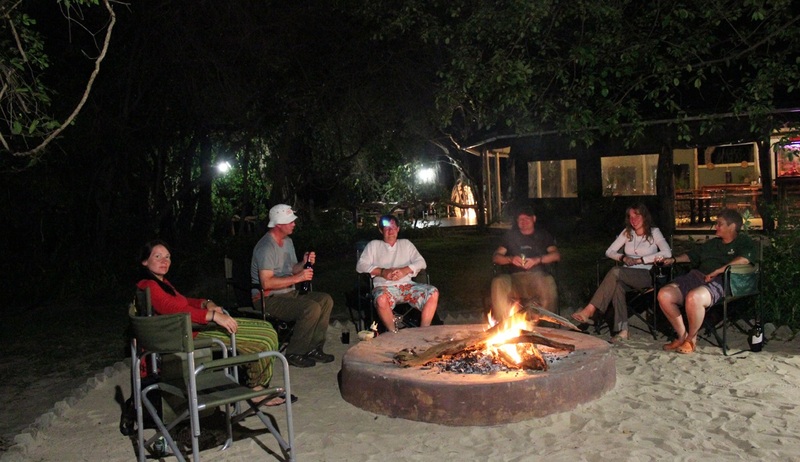 .Wild Dog Safaris carry out camping tours throughout Namibia, Botswana and Zimbabwe. Staying in excellent camping sites across these 3 countries you will experience the very best of these remarkable areas without compromising on the true safari experience. The camping tours are operated as “limited participation camping”, meaning that participation will be required for the set up of your tent but everything else including meals and camp duties will be taken care of for you. You will be staying in good sized tents which are dome-shaped with built-in ground-sheets and screened windows and doors. They allow standing headroom and are simple to put up, though your guide will help with this. The mattresses you’ll find inside are approximately 5cm thick and covers are supplied, along with all other camping equipment, including chairs with backrests, tables, washstands, cutlery and crockery. The tents are also 100% bug proof. 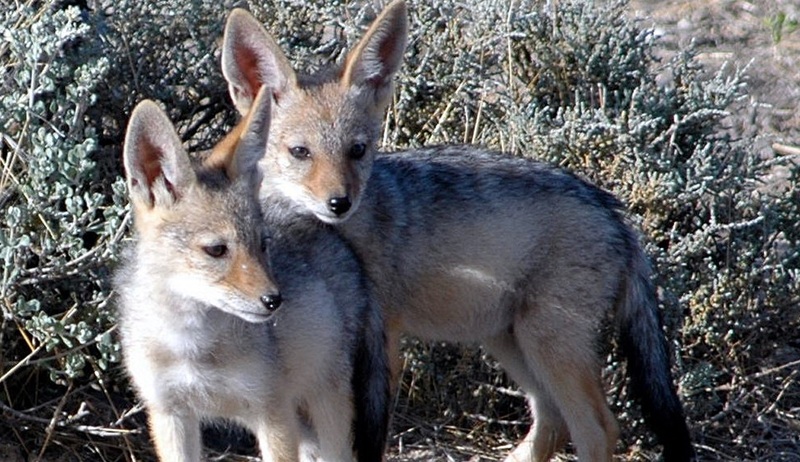 These tours are called camping trips, but “glamping” might be a more appropriate description! 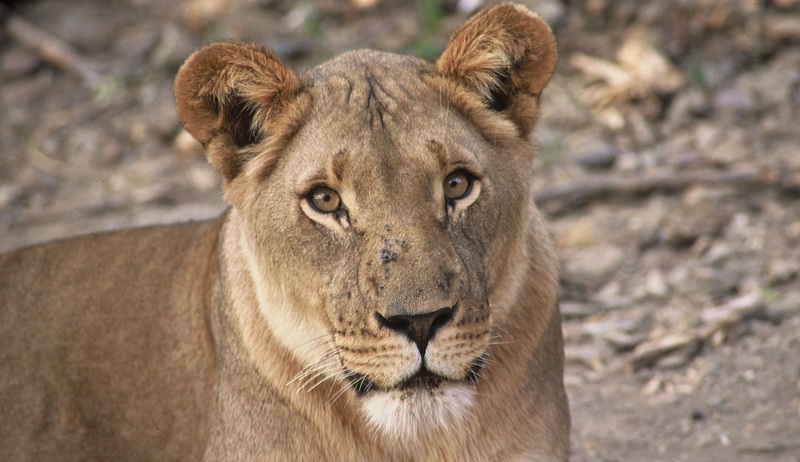 This is a truly special way to see all that Namibia, Botswana & Zimbabwe have to offer. Sleeping bags for the winter months may be hired or you are welcome to bring your own. 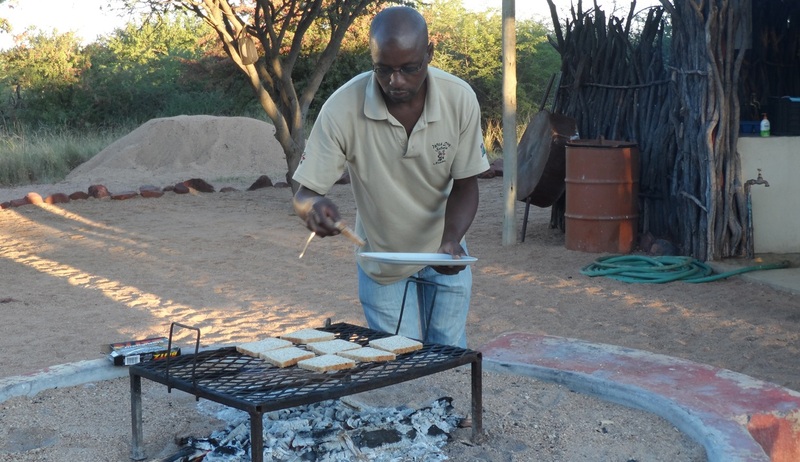 •	The lodges were excellent and very welcoming, I particularly remember the Kulala Desert Lodge for its wonderful location, however I think Damaraland Lodge has to take top spot, for the amazing bush lunch and dinner under the stars that they organised. I will also never forget the giant eagle owl that we saw hunting at dawn, a truly magical moment. •	We can’t thank you enough for recommending Namibia, it’s simply amazing! The people are so friendly, the landscapes are awe inspiring, the night skies unforgettable and the wildlife so diverse, we loved every minute. Doing a self drive was definitely the right option for us, it gave us just the flexibility we crave and felt completely safe, we would do it again without a doubt. Really glad I went. Had a brilliant time. Guides were great. What an experience , saw everything I wanted and more. Village visit and project visits (despite my slightly negative expectation) were really enjoyable, in fact taught me a lesson or two.